Oh, look at my cute pink girlie-gun with the laser sights and no safety…w­ha…[bang­]..[thud!] That’s not my fault! I’ve been kinda sorta trained in gun safety, and I didn’t mean to shine the laser in his eye! I couldn’t help it if he flinched and set off the gun! That was his choice. I didn’t force it on him. I have a right to carry a loaded gun, and I’m not forcing that choice on anyone! There are even places where *blind* people can carry guns. Well, Ms. Klein, a gun is a weapon, not a fashion statement. A gun is made to kill living things. By treating it like an accessory or a conversati­on piece, you make a mockery of the right to bear arms. You also demonstrat­e how people should have a good reason to be carrying a gun, more than simply to make a political statement or out of paranoia. You have demonstrat­ed a complacent or careless attitude toward guns that will become more common as more people carry for impulsive or frivolous reason. This makes tragedy inevitable­. Kansas has joined the ranks of crazyville. 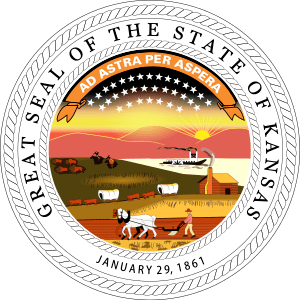 Kansas Attorney General Derek Schmidt has expressed concerns about changes to the concealed-carry law that prevents the state from denying gun permits to the blind and other people with serious physical disabilities. The Legislature also has removed all requirements that people who wanted to renew their license must pass a close range accuracy test. I’ll start with the stupidity of letting blind people carry guns, let alone carry them concealed. These are people who, by definition, have virtually no ability to aim a gun, let alone verify a target or make sure the line of fire is clear of innocent people. They intend for someone who cannot legally buy a gun to use it. Lawmakers care more about ideology than public safety. Next up, people with serious physical disabilities. Putting a gun in the hands of someone who cannot physically control it is inherently dangerous, and a potential threat to the public. Finally, people who have not proven their ability to hit what they aim at, even at close range. Putting a gun in the hands of someone who might shoot it wildly is inherently dangerous, and a potential threat to the public. These changes to the law promote a 2nd amendment ideology while turning it’s back on the general welfare of the citizens. It is crazy bad government. I was double-checking some information before writing a comment, and discovered that the Kansas City Star has scrubbed the article this post is based on. Other articles on this subject seem to be based on a single AP article. This raises a flag for me.Further research is in order. Dereck Schmidt is a gun rights enthusiast, which lends credence to his concerns about the law. Still needs more, as time allows.